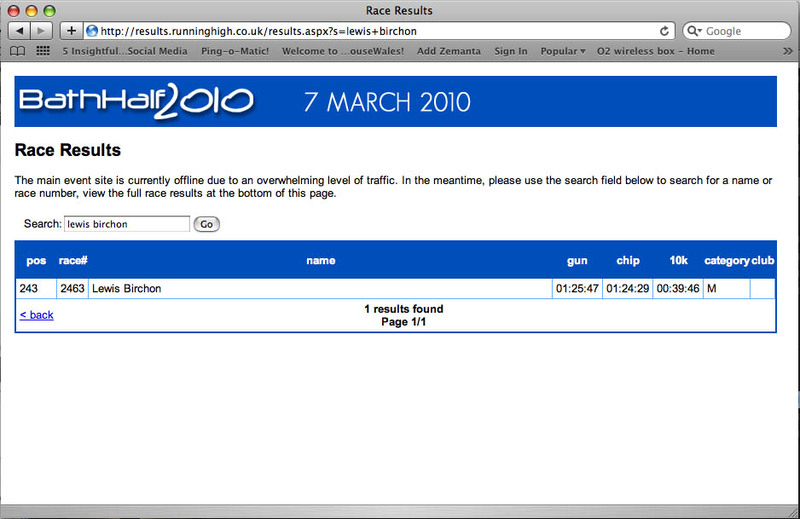 The Bath Half Marathon had a split timer at the 10k point. While I was eager to receive my chip time, I was intrigued to know how my split compared with the 10k times I had run in 2009. Before I conceived of running the Paris Marathon, and even during the early weeks of building up my training for the marathon, the 10k had been an almost obsessive focus. I started running with the goal of completing the Oxford Town & Gown in May 2009 in under 45 minutes. I achieved it – but by the smallest of margins, clocking in at 44:59. I ran several other 10k races, all the time knocking seconds or minutes off my time. Eventually, I got to the point where I realised I was capable of running a sub-40 minute 10k. At this point, I lined up races, desperately trying to get through the threshold time. My penultimate race of the year saw me get a PB of 38:46… Shortly before catching a nasty cold-flu that completely knocked my ability to get even close on the Boxing Day race that closed my running year. So, having achieved my sub-40 goal, I subsequently hadn’t run the required pace. In increasing the length of my runs, I had been worrying that for what I’d gained in stamina, I’d lost proportionately in speed. While my time for the half marathon was a great psychological boost for the marathon, I felt the need to pick at the scab of the 10k. ← Running to or from?